In the Missionary report of 1816 on Griquatown (page 858 paragraph 10), it is stated that money is “utterly unknown” in that part of the world. Secondly that “a coinage of silver tokens” are procured for the Griquas by the Directors of the London Missionary Society. 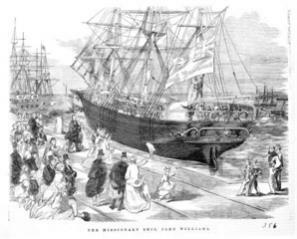 In the report of 1816 it was stated that the Griqua had no money, so money was ordered for them from England, and now in the1821 letter it is shown that the Griquas received money from somewhere because it is shown that they pay their contributions partly in money. We now have 100% proof that the Griqueas indeed used money at Griquatown but where did they get if from and what coins were they? 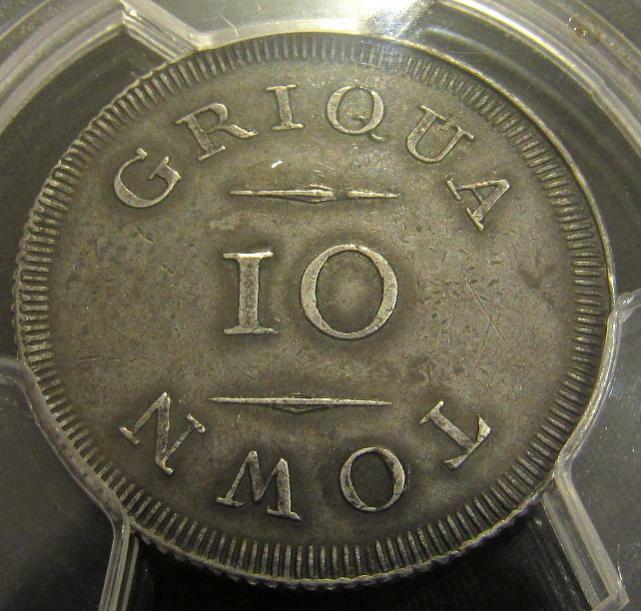 Even if we can prove that the Griquas got money from the Missionaries, it could have been other types of coins. And even if they were some Griqua pieces given to them, then these could have been handouts as trinkets or keepsake presents and NOT used for actual commercial transactions. So what we must prove 100% is that the Griquatokens were actually used as payments for services or goods. If we can prove that,we can say without any doubt that they circulated – passed from one hand to another in Griquatown. It is the word “rate” that is used in this sentence that is the key that unlocks this whole enigma. So the silver pieces were dispersed for something else in return, and the missionaries later found to their detriment, that the exchange rate in this dispersement was too low. The Mission lost out and the Griquas gained for some or other reason when the coins changed hands between the two parties. The next question is WHAT was offered in return for the pieces during their dispersement? 1) Nothing – they were trinkets – free handouts. Number 1 is impossible because we know that something was offered in the return for the token coins – the word “rate” tells us that as in “dispersed the silver pieces at too cheap rate”. When one hands someone a gift, there simply cannot be an exchange rate – it is a one sided transaction – nothing is offered in return. So it must have been either Goods or Labor Services or both. The fact is that the Griquas were OVER-PAID (paid too much) being it for buying chickens from them or paying them to work in the gardens or doing the washing. They were paid with the Griqua coinage and paid long enough for the Missionaries to realize their mistake (by paying at a too high rate) and stop dispersing the coins. We even know at least one person, whose hand it left in payment - and that person was Reverend Anderson. The last question we must answer now is WHY were the Griquas over-paid and what “rate” are we refering to? See part 2 to follow shortly. You have shown unbiased scholarship in the above. 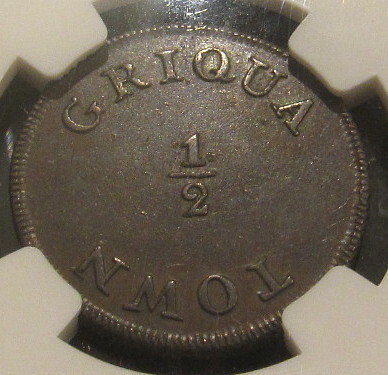 The Griqua coins must have been used in some form of transaction at that time, the exact details of that nature have been lost in the evidence so far presented. If only these mute coins could talk !! Something that is quite interesting is the continuity of design between the original (British) Halliday pieces (1814-1816) and the (German) Lauer patterns of 1890. 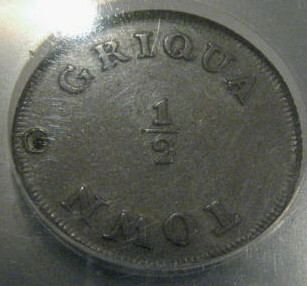 The 1890 patterns would have been based on something that was contemporary with the Griquas, so what better model for a proposed new coinage than one basaed on the existing but failed 1814-1816 pieces: "Griquatown" in both instances is broken up somewhat unusually into the words "Griqua" and "Town", both have the dove and olive branch symbol of the London Missionary Society and - as with the original coins - one of the two 1890 pattern-types is even undated. 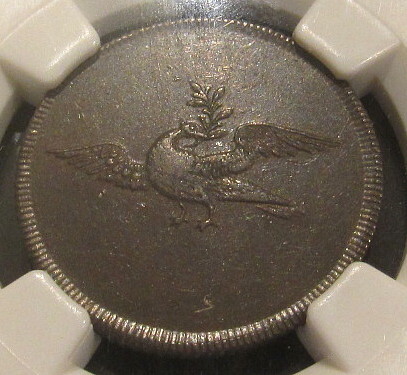 Maybe the Germans coin makers in the 1890's were in a better position to determine the useage/popularity or otherwise of the 1814-1816 coins than we are a further 120 years after the Germans? And maybe that is why Lauer integrated key features of the original GQT coins into the 1890 patterns.....? I was wondering if you have any more info, or a copy other than the Griqua coins, of the emblem of the LMS. The dove of peace seems to have been used by various missions. Also missionary ships flew the flag with three doves ie. The Duff. The only emblem that I can find is that of the Church Missionary Society. 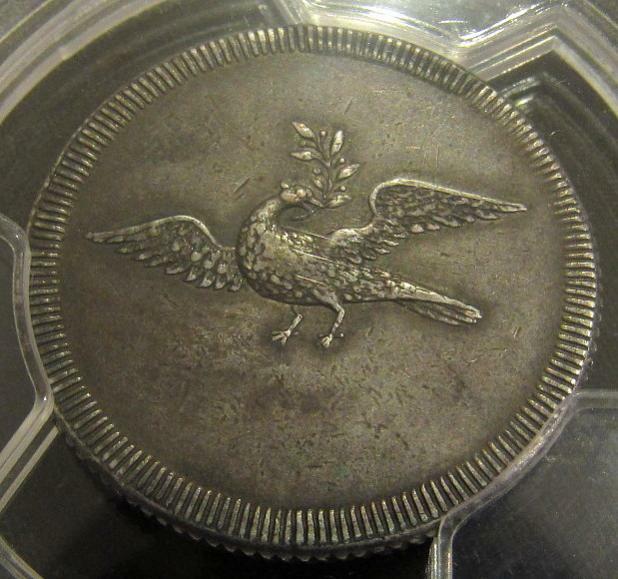 My question is, whether the dove on the Griqua coins is really the emblem of the LMS, or just a symbol representing missionary work in general. But of course, assumptions can be dangerous. 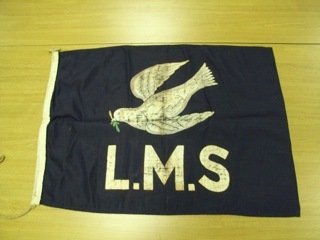 It seems that the dove with the olive branch was the ensign flown by LMS ships in the Pacific. Good information. I did pick up some info in that regard - ships of "Bethel" (sp?) or something like that.